All of you that came to support us and the families we will be supporting! We made right around $8,000.00. We are super excited for next year! Click the download button and your photos will download to your device. Every year since 2012 we have done a Santa photo fundraiser. Every year we are reminded what a generous, loving community we live in. There are so many options for Santa photos but yet year after year we are supported and successful at this event! To think that we went from being to help one family in 2012 to now helping 3 families and 2 non-profits that will go on to help others throughout the year, just makes our hearts full. We want to THANK everyone who came out for our first day! You can find your photo from the link below. If you do not see your photo please email us at bwarriorproject@gmail.com with a description of what your child was wearing so we can locate it and download. Our daughter Grace had low birth weight, had trouble gaining weight and soon needed a G-tube for adequate nutrition within her first year of life. During her first year of life she was tested for many things, but no one could explain what was wrong with her. Grace was suspected to have mitochondrial disease by age 2 and then diagnosed at age 4 1/2 through a muscle biopsy. Grace is 13 years old and has become a very busy teenager. This summer she will do horseback riding and swimming. She will participate in Summer Social Skills Camp, OT and ABA therapy. Grace will also get to attend overnight camp again, which she really enjoyed last year. Grace is incredibly social, enjoys learning, and loves being outside, loves to play in water, & is pointing and expressing her opinions more often. She uses her wheelchair to communicate, also, by propelling herself to her want or need. She is learning to use her sign language more consistently and working on spelling words on a letterboard. Grace is a smart girl and she is getting the chance to show us. We also think she is a silly joker and daredevil. We are so proud of her. CHARGE syndrome is a recognizable genetic syndrome with known pattern of features. It is an extremely complex syndrome, involving extensive medical and physical difficulties that differ from child to child. Babies with CHARGE syndrome are often born with life-threatening birth defects. They spend many months in the hospital and undergo many surgeries and other treatments. Swallowing and breathing problems make life difficult even when they come home. Most have hearing loss, vision loss, and balance problems that delay their development and communication. Despite these seemingly insurmountable obstacles, children with CHARGE syndrome often far surpass their medical, physical, educational, and social expectations. He spent 4 months in Children's NICU, he has had 10 surgeries. He had a tracheostomy tube for 2.5 years because of his inability to swallow. His main struggle right now is swallowing and balance issues-- and he needs to have open heart surgery to correct an atrial septal defect this month. I think some of the common issues effecting CHARGE kiddos are hearing/ vision issues (deaf, hard of hearing) and blindness, heart defects, growth restriction, poor tone, and difficulty swallowing, and balance issues due to inner ear differences. Isaiah is blind in his left eye and is hard of hearing. He loves horse back riding, LEGOS and his brothers. Thank you so much Erica for helping to raise awareness about CHARGE and other rare conditions. Isaiah is such a Brave Little Warrior!! We are honored to be able to share his story and help bring awareness about CHARGE syndrome. Anthony is our ray of sunshine! He is 9 years old, and has been healthy for 2 ½ years. We fought to keep him alive for the first 7 ½ years! Anthony was born with Trisomy 21, also known as Down Syndrome. Children with DS tend to have low tone muscles. They are “floppier” than typical children. When we “got” Anthony at 2 weeks old, Andy and I had to stay overnight at the hospital to learn how to feed Anthony properly, so he wouldn’t aspirate on his formula. 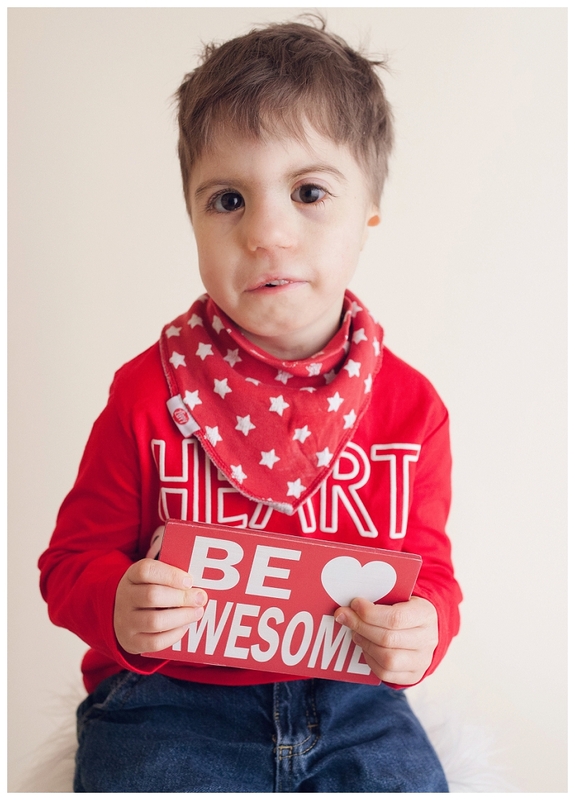 Anthony had a heart defect called Tetralogy of Fallot. This allowed non-oxygenated blood to mix with oxygenated blood in his heart. When a body deals with this, it burns so many calories and it is very difficult to get a baby to grow big enough to have the best chance with surgery. We had to learn to mix formula high in calories. Anthony needed open-heart surgery to fix this at just 3 months old. One thing I remember about this time was getting pictures done of Anthony the day before, so we’d have some classic baby pictures of him, before he had any scars. Surgery was the day before Thanksgiving that year. Everything went well, and the surgery was actually pretty routine. To us, it was anything but routine! Anthony continued to heal, we learned to pick him up in a scooping motion, supporting his back, and everything healed as expected. We went for regular post-op checks, and everything was wonderful! At the 6 or 9 month post-op check, the cardiologist said we didn’t need to come back anymore, except for yearly. He said we could treat Anthony like any other child and not make everyone be germ-free if they were around Anthony. Well, I still worried, and for good reason. A couple months later, something wasn’t right. We went to the doctor and emergency room several times over 2 weeks, and finally were admitted to the hospital when Anthony’s oxygen level was at 60%. The nurses scrambled at this point. Anthony’s lungs had pneumonia on the x-rays, and so bloodwork was taken to determine what kind. The next day, the pneumonia had disappeared, but that bloodwork showed that Anthony had leukemia. Anthony and I had 15 minutes to be packed and in the ambulance to Seattle. My middle 3 children were at Seattle with Anthony and me for 14 months, while our oldest 2 children stayed at home with Andy. Our family was physically split for most of that time. Our greatest gift during the 14 months came from my friend, Jenny. She arranged for a hotel suite for our whole family at Christmas time, so we could all sleep under the same roof. Ronald McDonald House can only have 6 people in a room overnight and we have 6 children. We finally got to come home in February 2011. We had left to Seattle on Dec. 3, 2009. You don’t forget a date that turns your life so completely upside down! On a more positive note, Anthony’s adoption was final in Nov. 2010! For another 2 ½ years, we regularly commuted to Seattle for appointments and chemo. A few times, Anthony developed pneumonia which required a long stay at Children’s. After chemo was complete, Anthony started getting sicker, especially when we traveled at higher altitudes. Going to Children’s was dicey because his oxygen would plummet when we’d get to the top of the pass! We had a real scare when our family went on a cross-country road trip and were stuck in Colorado a couple days in really high altitude. That fall, we used oxygen all the time to help Anthony. If he had a runny nose, his lungs couldn’t keep up and he’d need oxygen. Same with a sniffle or any tiny symptom. Finally, our pulmonary specialist (who travels to Wenatchee for Children’s regularly now!! ), discovered that Anthony’s left lung was squished. The lung wasn’t moving at all. There was no way to know if it was paralyzed or if it just didn’t have room to work. Testing was inconclusive. The only other option was surgery, and that was just a possible solution, not definite. Anthony had surgery, where a diaphragmatic hernia was discovered and repaired, a kidney was put back where it belongs, and his intestines were put back where they belong. The kidney and intestines had moved because of the hernia. The surgeons never expected Anthony to have such an amazing outcome to this surgery, and joked at the post-op check a year later that we come basically just to tell them hi, because he is doing so well! Anthony finally stopped being so sick around 7 ½ years old. His time before that was basically just a whirlwind of just trying to keep him alive and trying to stay one step ahead of any more diagnoses. We never really had a chance to think about Anthony’s future, and especially education. We never knew if he’d live long enough to get to go to school. Now, I still worry about medical stuff and am always on the lookout for odd symptoms. I don’t even know what’s normal to send a child to school with anymore. Runny noses? Small cough? These were things he couldn’t be around for so long. But, more than medical stuff, I worry about Anthony’s chance at indepence someday. I worry about him receiving the best education possible. He has a wonderful teacher now, and he loves school. He loves to learn, play, and interact with EVERYONE at school, home, church, and around the community. We continue to utilize therapies aimed at maintaining and improving abilities for Anthony. He has had physical therapy of some form since he was 2 weeks old, along with Speech therapy and Occupational therapy. Anthony actaully graduated from Ohana Occupational Therapy today, the day I am writing this post . Because Anthony has weekly swim therapy, his lungs actually did much better before the last big surgery than they would have had he not done the swim therapy. Anthony participates in Cub Scouts, and loved being in hip hop dance a couple years ago. We are looking to continue that. And now, Anthony is starting to participate in Special Olympics! It seems like there’s a different cause or some awareness campaign every month. They more often than not seem to apply in some way to Anthony. He’s a success story for foster care, adoption, congenital heart defect, childhood cancer, diaphragmatic hernia, and of course, Down syndrome! I am so grateful that when we were missing someone in our family, that Anthony was the someone who filled the void we had no clue was there! I have been following this little warriors story for awhile now! This little warrior has Type 1 diabetes. He was diagnosed at age 4. Type 1 Diabetes is an autoimmune disease in which the body attacks the insulin-producing cells in the pancreas. The only treatment for the disease is a lifelong dependence on insulin therapy-- through multiple daily injections or a pump. There is no remission; there is no cure. This disease requires constant care and vigilance in terms of counting carbohydrates, administering the correct amount of insulin, and monitoring blood sugar to avoid going high or low-- all of which, if miscalculated, can become a life-threatening situation. This disease consumes families. There is no break and caregivers often experience burnout and exhaustion trying to keep their child alive. When it comes to cold and flu season, families with Type 1 experience an increase in anxiety. The flu, which is miserable but manageable for us, has the potential to land our kids in hospitals. Some even die. Because our small community isn't equipped to care for kiddos with Type 1, these kids are often life-flighted to Seattle in serious/critical condition. This is a very life limiting condition for the entire family. They are constantly monitoring for highs and lows. They have had many sleepless nights due to the brittleness of this disease. This disease is SCARY!!! I know of so many little warriors here in our area with this disease! Please help bring awareness by sharing this knowledge! Little Warrior Nate has Prune Belly Syndrome. This is a rare genetic birth defect affecting 1 in 40,000 babies. A partial or complete lack of abdominal wall muscles. There may be wrinkly folds of skin covering the abdomen. Urinary tract abnormality such as unsually large ureters, distended bladder, accumulation and backflow of urine from the bladder to the ureters and the kidneys. While Nate was in the womb he had a bladder obstruction which caused kidney damage. The kidney damage cannot be reversed. Nate’s kidney functioning will be closely monitored with frequent trips to Seattle Children’s. He will likely need a kidney transplant in the future. Because of the problems in his urinary tract system, Nate is very susceptible to urinary tract infections. Nate had an infection when he was a week old that rejected most antibiotics. Since his birth, sweet little Warrior Nate has had multiple infections and has been o multiple antibiotics. In addition, he will have a Ureteral Reimplantation surgery sometime in the next few months. In six months, he will have reconstructive surgery to help support his little tummy. Nate is a little fighter and despite everything he has already endured in a short amount of time, he is a happy baby who loves being cuddled! 2012, that is the year we started this event. It was called Shoot for Mac! Mac was a 12 year old boy diagnosed with cancer. He went to the ER and was taken by ambulance over to Seattle Children's Hospital where his mom and he would live for the next 9 months. In one week we gathered up a team and Santa and threw the first event. In one day we raised $6,000! We saw what an impact this made and decided to continue the tradition every year. This year we offered a breakfast with Santa sponsored by Glaze Bakery in East Wenatchee (huge hit). We took over 3000 photos!! To this date we have raised over $36,000 just in money. The last three years we have included a toy drive that continues to be a huge success bringing in thousands of dollars worth of toys! We want to thank the community for continuing to support our little (BIG) event! Here are a few pictures from the two days this year! 43 children per day are diagnosed with cancer. 40,000 children undergo treatment for cancer each year. Families in small towns are forced to move to larger cities for 9 months to 1 year on average. These are just a few statistics on Pediatric Cancer Awareness. We at The Brave Warrior Project are on a mission to help eliminate the financial burden and barriers that often exist for families that have faced or are facing this journey. We want to help ALL local children and their families! We welcome you to join us on September 9th in supporting our Brave Warriors and their families! Children's Denistry (Sponsor of The Super Hero Walk) will have a presence! This is a fun event for the whole family! Please email us at bwarriorproject@gmail.com with any questions!